Philadelphia Union midfielder Jamiro Monteiro holds off Los Angeles Galaxy midfiedler Jonathan dos Santos during the Galaxy's 2-0 win at Dignity Health Sports Park in Carson, Calif. 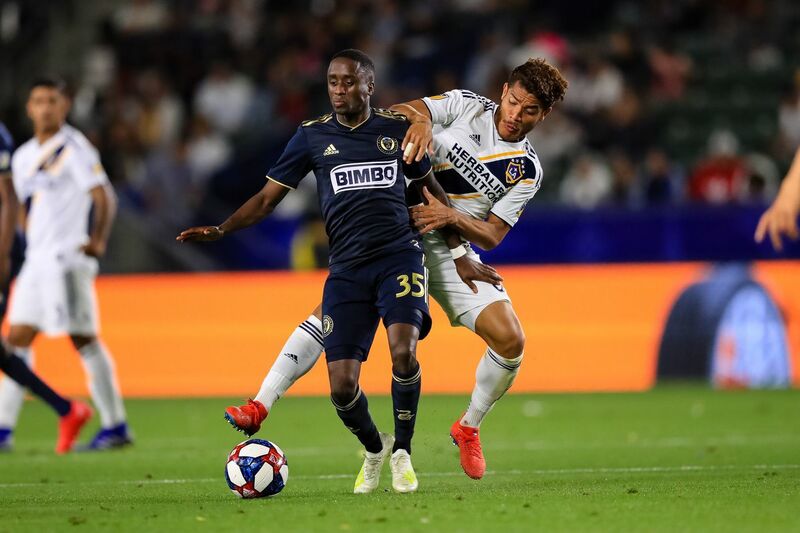 The Union’s 2-0 loss at the Los Angeles Galaxy on Saturday (and early Sunday) will likely be quickly forgotten. Before that happens, though, here are a few observations on the game. After playing two games as a substitute, Jamiro Monteiro made his first start for the Union. It was a good performance, but a mostly quiet one: 85 touches, 1 shot, 2 chances created, 6 tackles and 59 of 65 pass attempts completed. It didn’t help that the Union were playing catch-up for much of the night. The Galaxy also have a terrific central midfield trio of Sebastian Lletget, Joe Corona — who isn’t usually a deep-lying player, but did the job well in this game — and Jonathan dos Santos. In order to get Monteiro into the starting lineup, Marco Fabián moved up to the front line as a second forward alongside Cory Burke. Though Fabián was limited to 23 minutes by an ankle injury, the idea behind the tactical shift was a good one. It’s a virtue to set up different kinds of forward partnerships against different kinds of teams. This duo was set up for Fabián to play behind Burke, turning the Union’s formation into more of a 4-3-2-1 than a 4-4-2 diamond. Given the Galaxy’s many potent attackers and their ability to pass the ball quickly, playing a high press with recent starters David Accam and Fafa Picault up top likely wasn’t going to work. In the end, the changes didn’t matter, because Los Angeles was simply too good. But give Union manager Jim Curtin credit for again being willing to try something different. For the record, Fabián finished the night with 12 touches, 1 shot and 1 interception, and he completed all seven of his pass attempts. It didn’t look like he was hurt too badly, though it’s concerning that he was seen on crutches after the game. Fabián wrote on Instagram on Sunday that it’s a sprain and he doesn’t know the severity yet. If he recovers in time to play next weekend against Montreal, we’ll see how he and Monteiro line up against an Impact team that the Union should be able to press much more easily than the Galaxy. As has been said here before, Monteiro’s best fit might be at the bottom of the diamond, leaving Haris Medunjanin as the odd man out instead of dropping a forward. In theory, Los Angeles’ goals could have come from someone else. But really, could anyone other than Zlatan Ibrahimovic have commanded the spotlight? This game served as a reminder that in addition to his exceptional skill, the 37-year-old Ibrahimovic is a physical beast of a player: 6-foot-5 and 209 pounds. He used every bit of his frame on both goals. Even if you think he pushed off Auston Trusty on one or both goals — and you wouldn’t be wrong if you do — Ibrahimovic is just as willing to score ugly goals as pretty goals. That deserves respect. As noted above, this game will probably be forgotten quickly. But the fact that it can be forgotten is a good thing. The Union’s tie in Atlanta and win at Cincinnati bought this team the ability to take a road loss without having to worry too much. It will be a different story if the Union lose at home to Montreal, of course. But for now, there isn’t much reason to be concerned.